One aspect of pet ownership that some owners tend to neglect is grooming. It is more important than it may seem to keep your pet well groomed. 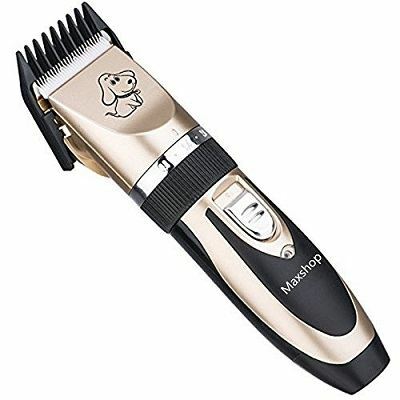 There are several reasons why it is important to groom your pet properly, and we will go over some of them before we get into our review of the Maxshop grooming kit. Depending on your dog's fur, you will notice different patterns when it comes time to groom it. Some dogs, which have long and wispy hair will develop tangles and other issues which may even have to be cut out. Often, you will find that these tangles and hitches in their fur can be causing your dog pain. If you would like to ensure that your dog is both healthy and happy, it is important to smooth any imperfections out of their fur. Poorly maintained fur is a breeding ground for all sorts of bacteria and other organisms, such as ticks. Regular grooming is, in fact, one of the best ways to ensure that your dog's fur does not become a colony to parasitic entities. Beyond your dog's health, there is the simple aesthetic value of having a well-groomed dog. When you take your dog out for walks, you do not want it to look ratty and dirty. A dog which has been groomed well will stand out in comparison to other dogs. Our dogs do so much to keep us happy, the least we can do is return the favor and ensure that they are both looking and feeling great. We will now look at some of the more important aspects to search for in a grooming kit. You will want to opt for a kit that features a good measure of variety in regards to the guide combs which are included for use with the electric razor. This is important because it will allow you to use the electric razor with your pet regardless of its fur length. Different guide combs will have different lengths, so you can ensure that you are cutting your dog’s fur to the preferred length. You will also want to ensure that the included guide combs are durable enough to withstand repeated use without breaking. You will find that a wireless electric razor is highly preferable to a wired model in several regards. Primarily, the best aspect of a wireless electric razor is that it is capable of being used in any position without the wire getting in the way. Anyone who has had to groom their dog with a wired electric razor can attest to the difficulty of keeping it out of the way throughout the grooming process. Certain wireless models even give you the option of being charged during use, this allows them to essentially function as a wired model for those longer grooming jobs. 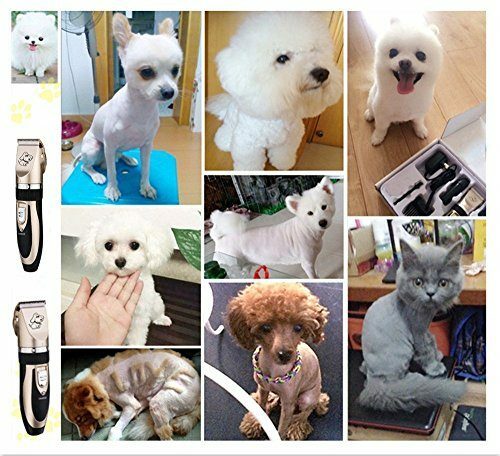 This pet grooming kit is manufactured by Maxshop. It is a rather comprehensive kit that includes most of the accessories that you will require to groom your pet properly. These accessories include a wireless electric shaver with four guide combs, sized at 3mm, 6mm, 9mm, and 12mm. Also, this kit includes stainless steel scissors and a stainless steel comb. It also features a brush so that you may clean any excess fur off of your pet when you are done grooming it. This is one of the more comprehensive pet grooming kits you will find on the market for such a low price. The main attraction in this grooming kit is the electric shaver, and we are happy to say that it met and even exceeded our expectations. Unlike electric shavers that you will find in other grooming kits, this model has been constructed with a focus on quality. While it may not be as effective as models which cost hundreds of dollars, it is very reliable and effective for its price range. The inclusion of four guide combs also allows you to choose the length of your pet’s hair. When it comes to the other included accessories in this kit, there is no reason to complain. The scissors have a smooth cutting motion, making it easier to cut hair more precisely. The included comb is somewhat basic, but it gets the job done. After looking through customer reviews, we have compiled some of the more common praise and gripes about this product. Most customers praise this kit’s excellent value for money, including several pet grooming accessories for a lower price than an individual electric razor. On the other hand, some customers had complaints about the need to cut the hair of certain dog breeds with scissors before using the electric razor. If this step is skipped, the razor may get jammed up with fur. While this is a bit of a nuisance, it is no different from many other models of an electric razor. This product can be purchased from online retailers such as Amazon. The Maxshop Grooming Kit can typically be found for around 30 dollars, which is one of the best prices we have seen for pet grooming kits. 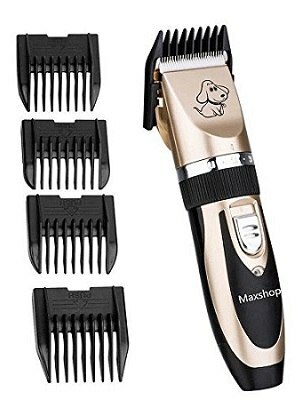 If you are looking for a pet grooming kit which is affordable without sacrificing effectiveness and reliability, you will find that this product from Maxshop ideally fits your needs. We hope that this review has been informative and comprehensive. Do not hesitate to leave a comment below in the event of questions.